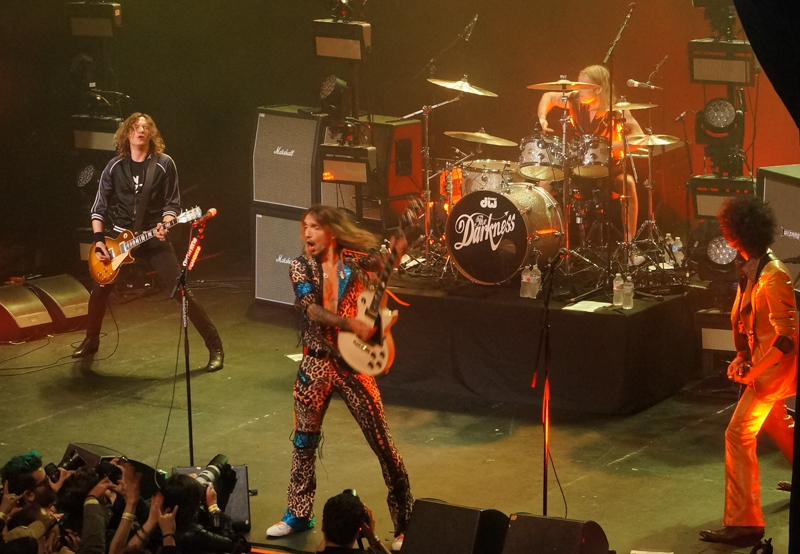 The Darkness opened their American “Tour De Prance” last night by recording a live album at the Fonda – or as lead singer/ guitarist Justin Hawkins called it, “The Fondant”, suggesting a cake-themed marketing campaign for the record would be in order. Even when the guy’s just making a pun on the name of the venue they’re in, he’s thinking about image. But it’s cool, because it’s a good image. The people in this band are doing shtick, and they know it. But they also believe in their own shtick enough to make it real, like Pinocchio. They really know, in their hearts, that if they can get us to put our hands in the air at the same moment, it’s going to brighten somebody’s day. And sometimes, having that little something to brighten your day means everything. That’s why they spent the time to perfect this shtick, to the point that you will put your hands in the air for this man without even realizing you’re doing it. It’s an old-fashioned kind of showmanship that he practices, and as your skinny prancing frontmen go, Hawkins is unquestionably one of the best on the circuit today. The band – also made up of Dan Hawkins “on the electronic guitar”, bassist Frankie Poullain, and Rufus Tiger Taylor on drums, often reminds me of AC/DC in a major key. But instead of a tough guy for a singer, they have this prancing dandy with the high voice. It’s worth mentioning, yes, he still hits those notes when he needs to, but doesn’t over-do the reliance on vocal gymnastics. He’s also funny, honestly so, not just somebody doing a comedy skit about rock. Hawkins is funny like David Lee Roth is funny. He borrowed a flannel vest, glasses and a baseball cap from various audience members, and pulled his long hair into a ponytail through the back of the baseball cap, in an attempt to demonstrate his best “pervert look.” Then he performed the next two songs in that getup. Now, this being opening of the tour, I don’t know if he does this take-clothes-from-the-audience thing every night, or just liked this girl’s vest and decided to ask “Can I have it?” just to see what she would do. But it was awfully funny. I wish the Darkness much success on this tour and the next. Unabashed celebration is important to our survival, and irony is the enemy of emotion. The Darkness may be self-aware but they are not ironic in any way. They are sincere about their belief in the thing called love, in the same way Zeppelin wasn’t exactly kidding when they declared themselves your overlords. As for me, I believe in a thing called Rock, and the continued existence of the Darkness is plenty convincing evidence. 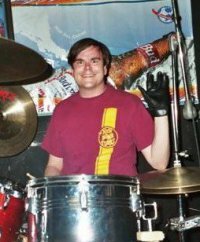 This entry was posted in Music and tagged Frankie Poullain, Justin Hawkins, Rufus Tiger Taylor, The Darkness, The Fonda, Tour De Prance. Bookmark the permalink.